In the days since the death of former President George H.W. Bush, many historic speeches, tributes and services have taken place — moments that will no doubt live on in American history. While we watch it all unfold in real-time, it’s easy to miss the humanity and grief that comes with saying goodbye, not just to a former president, but to a good and humble man of faith who leaves behind an incredible legacy and family. On Monday, Bush’s body was flown to Washington D.C. via Air Force One, and was laid in the Capitol Rotunda. Since then, thousands of mourners have paid their solemn respects to the former leader of the free world. Among the most notable visitors was fellow World War II veteran and former Senator Bob Dole. In an extremely powerful moment, with a little assistance, the wheelchair bound former Senator stood up to salute the last American president to have served in WWII. One of the most incredible things to witness has been politicians from all sides of the aisle, stand together as Americans to pay tribute to the honorable life of George H.W. Bush. Sully, George H.W. Bush’s service dog, was also brought to the capital for a touching final farewell. Although Sully was fairly recent addition to the Bush family, joining the late president after the passing of his wife Barbara Bush, he was always by his side and loyal to the end. Sully’s mission in serving the late president is complete. A funeral service was held Wednesday at the National Cathedral in Washington D.C. In a rare scene, all of the living presidents, including President Donald Trump, sat together to honor George H.W. Bush. Seeing these leaders, many who have campaigned hard against one another, come together, smiling and shaking hands is not a sight to take for granted. It’s a uniquely American moment. 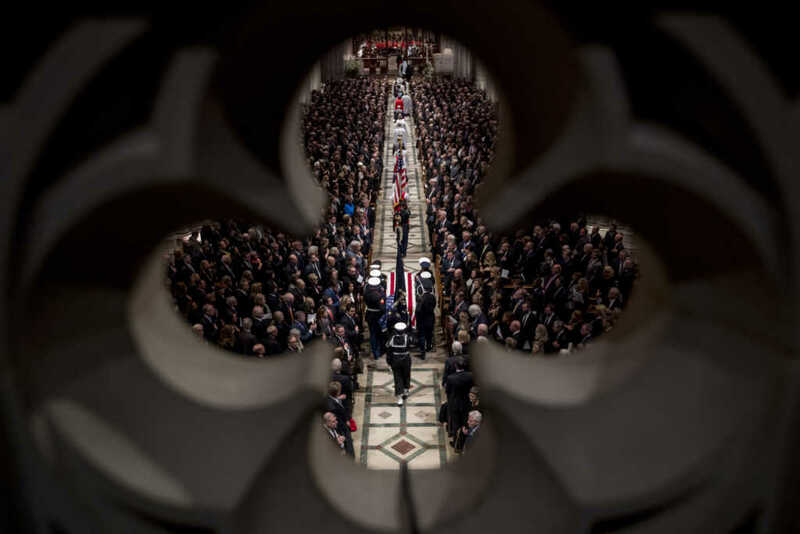 Eulogies at the service were given by former colleagues in the Senate, faith leaders, grandchildren and, of course, the 43rd president of the United States, George H.W. Bush’s oldest son, George W. Bush. Former President George W. Bush, the first born son of George H.W. Bush greeted his presidential predecessors, and shared a sweet moment with former first lady Michelle Obama. Jenna Bush Hager was among the speakers at her grandfather’s funeral, sweetly touching his casket as she walked back to her seat. Clearly emotional, Jenna could be seen squeezing her father’s hand as she walked passed him after speaking. Former President George W. Bush and his brother former Florida Governor Jeb Bush were clearly moved by the words said about their father. From laughter to tears, it was powerful to see the lasting impact George H.W. Bush left, not just on his family or the thousands in attendance at the cathedral, but on viewers watching all across the country. Among a long list of notable speakers was, of course, former President George W. Bush, who greatly honored his late father with a stunningly beautiful eulogy. Holding back tears throughout, it wasn’t until he was closing, reminding everyone that, “Dad is hugging Robin and holding Mom’s hand again,” that George W. Bush broke down in tears. The entire nation likely followed suit. As the 43rd president left the pulpit and passed his father’s casket, he gave it a loving double pat as he walked back to his seat. The 41st president’s body boarded Air Force One a final time following the funeral to make the trip back home to Houston for a second and final memorial service will be held at St. Martin’s Episcopal Church in Houston on Thursday. The late president’s body will then be transported by a motorcade procession to the George H.W. Bush Presidential Library in College Station, Texas, where he will be buried next to his late wife of 73 years, Barbara Bush, and their daughter Robin.